Difference between revisions of "Espil Ecilidae Airport"
Espil Ecilidae Airport is a medium-large airport in the southwest that is still under construction, but operational. 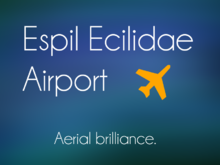 Espil Ecilidae Airport is still not completed, but is expected to be completely finished by December 30th, 2019. Note: Tiny gates are only 20x20 blocks.